This article is about the Eskimo–Aleut language. For the extinct North Germanic language, see Greenlandic Norse. Greenlandic is an Eskimo–Aleut language spoken by about 56,000 Greenlandic Inuit in Greenland. It is closely related to the Inuit languages in Canada such as Inuktitut. The main variety, Kalaallisut or West Greenlandic, has been the official language of the Greenlandic autonomous territory since June 2009; this is a move by the Naalakkersuisut (government of Greenland) to strengthen the language in its competition with the colonial language, Danish. The second variety is Tunumiit oraasiat or East Greenlandic. The Thule Inuit of Greenland, Inuktun or Polar Eskimo, is a recent arrival and a dialect of Inuktitut. Greenlandic is a polysynthetic language that allows the creation of long words by stringing together roots and suffixes. Its morphosyntactic alignment is ergative, meaning that it treats (i.e. case-marks) the argument ("subject") of an intransitive verb like the object of a transitive verb, but distinctly from the agent ("subject") of a transitive verb. Nouns are inflected for one of the eight cases and for possession. Verbs are inflected for one of the eight moods and for the number and person of its subject and object. Both nouns and verbs have complex derivational morphology. Basic word order in transitive clauses is subject–object–verb. Subordination of clauses is done by the use of special subordinate moods. A so-called fourth-person category enables switch-reference between main clauses and subordinate clauses with different subjects. Greenlandic is notable for its lack of a system of grammatical tense, as temporal relations are normally expressed through context, through the use of temporal particles such as "yesterday" or "now" or sometimes through the use of derivational suffixes or the combination of affixes with aspectual meanings with the semantic aktionsart of different verbs. However, some linguists have suggested that Greenlandic does mark future tense obligatorily. Another question is whether the language has noun incorporation, or whether the processes that create complex predicates that include nominal roots are derivational in nature. When adopting new concepts or technologies, Greenlandic usually constructs new words made from Greenlandic roots, but modern Greenlandic has also taken many loans from Danish and English. The language has been written in the Latin script since Danish colonization began in the 1700s. The first orthography was developed by Samuel Kleinschmidt in 1851, but within a hundred years already differed substantially from the spoken language because of a number of sound changes. An extensive orthographic reform undertaken in 1973 that made the script easier to learn resulted in a boost in Greenlandic literacy, which is now among the highest in the world. The Greenlandic language was brought to Greenland with the arrival of the Thule people in the 1200s. It is unknown which languages were spoken by the earlier Saqqaq and Dorset cultures in Greenland. The first descriptions of Greenlandic date from the 1600s, and with the arrival of Danish missionaries in the early 1700s, and the beginning of Danish colonialism in Greenland, the compilation of dictionaries and description of grammar began. The missionary Paul Egede wrote the first Greenlandic dictionary in 1750, and the first grammar in 1760. Illustration 1: Distribution of Inuit language variants across the Arctic. From the Danish colonization in the 1700s to the beginning of Greenlandic home rule in 1979, Greenlandic experienced increasing pressure from the Danish language. In the 1950s, Denmark's linguistic policies were directed at strengthening Danish. Of primary significance was that post-primary education and official functions were conducted in Danish. From 1851 to 1973, Greenlandic was written in a complicated orthography devised by the missionary linguist Samuel Kleinschmidt. In 1973, a new orthography was introduced, intended to bring the written language closer to the spoken standard, which had changed considerably since Kleinschmidt's time. The reform was effective and in the years following it, Greenlandic literacy received a boost. Another development that strengthened the Greenlandic language has been the policy of "greenlandization" of Greenlandic society which began with the homerule agreement of 1979. This policy has worked to reverse the former trend towards marginalization of the Greenlandic language by making it the official language of education. The fact that Greenlandic has become the only language used in primary schooling has meant that today monolingual Danish-speaking parents in Greenland are raising children bilingual in Danish and Greenlandic. 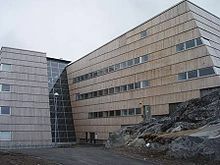 Today Greenlandic has several dedicated news media: the Greenlandic National Radio, Kalaallit Nunaata Radioa, which provides television and radio programming in Greenlandic. The newspaper Sermitsiaq, has been published since 1958, and in 2010 merged with the other newspaper Atuagagdliutit/Grønlandsposten, which was established already in 1861 to form a single large Greenlandic language publishing house. Before June 2009, Greenlandic shared its status as the official language in Greenland with Danish. [note 1] Since then, Greenlandic has become the sole official language. This has made Greenlandic a unique example of an indigenous language of the Americas that is recognized by law as the only official language of a semi-independent country. Nevertheless, it is still considered to be in a "vulnerable" state by the UNESCO Red Book of Language Endangerment. The country has a 100% literacy rate. As the Western Greenlandic standard has become dominant, a UNESCO report has labelled the other dialects as endangered, and measures are now being considered to protect the Eastern Greenlandic dialect. 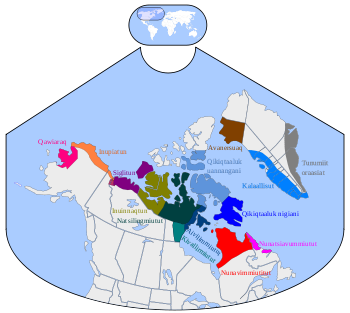 Kalaallisut and the other Greenlandic dialects belong to the Eskimo–Aleut family and are closely related to the Inuit languages of Canada and Alaska. Illustration 1 shows the locations of the different Eskimoan languages, among them the three main dialects of Greenlandic. 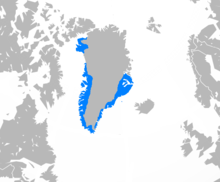 The most prominent Greenlandic dialect is West Greenlandic (Kalaallisut), which is the official language of Greenland. The name Kalaallisut is often used as a cover term for all of Greenlandic. The northern dialect, Inuktun (Avanersuarmiutut), spoken in the vicinity of the city of Qaanaaq (Thule), is particularly closely related to Canadian Inuktitut. The eastern dialect (Tunumiit oraasiat), spoken in the vicinity of Ammassalik Island and Ittoqqortoormiit, is the most innovative of the Greenlandic dialects, having assimilated consonant clusters and vowel sequences to a greater extent than West Greenlandic. Kalaallisut is further divided into four subdialects. One that is spoken around Upernavik has certain similarities to East Greenlandic, possibly because of a previous migration from eastern Greenland. A second dialect is spoken in the region of Uummannaq and the Disko Bay. The standard language is based on the central Kalaallisut dialect spoken in Sisimiut in the north, around Nuuk and as far south as Maniitsoq. Southern Kalaallisut is spoken around Narsaq and Qaqortoq in the south. Table 1 shows the differences in the pronunciation of the word for "humans" in the three main dialects. It can be seen that Inuktun is the most conservative, maintaining the "gh" which has been elided in Kalaallisut, and Tunumiisut is the most innovative, having further simplified the structure by eliding the /n/. Letters between slashes / / indicate phonemic transcription, letters in square brackets [ ] indicate phonetic transcription and letters in triangular brackets ⟨ ⟩ indicate standard Greenlandic orthography. Ranges of West Greenlandic monophthongs on a vowel chart. The Greenlandic three vowel system, composed of /i/, /u/, and /a/, is typical for an Eskimo–Aleut language. Double vowels are analyzed as two morae, so they are phonologically a vowel sequence and not a long vowel; they are also written as two vowels in the orthography. The only diphthong in the language is /ai/, which occurs only at the ends of words. Before a uvular consonant ([q] or [ʁ]), /i/ is realized allophonically as [e], [ɛ] or [ɐ], and /u/ is realized allophonically as [o] or [ɔ], and the two vowels are written e, o respectively (as in some orthographies used for Quechua and Aymara). /a/ becomes retracted to [ɑ] in the same environment. /i/ is rounded to [y] before labial consonants. /u/ is fronted to [ʉ] between two coronal consonants. /uiqarpuq/ "she has a husband" pronounced [ueqɑʁpɔq] and written ⟨ueqarpoq⟩. /illuqarpuq/ "he has a house" pronounced [iɬːoqɑʁpɔq] and written ⟨illoqarpoq⟩. Greenlandic has consonants at five points of articulation: labial, alveolar, palatal, velar and uvular. It does not have phonemic voicing contrast, but rather distinguishes stops from fricatives. It distinguishes stops, fricatives, and nasals at the labial, alveolar, velar, and uvular points of articulation. [note 2] The earlier palatal sibilant [ʃ] has merged with [s] in all but a few dialects. The labiodental fricative [f] is only contrastive in loanwords. The alveolar stop [t] is pronounced as an affricate [t͡s] before the high front vowel /i/. Often, Danish loanwords containing ⟨b d g⟩ preserve these in writing, although this does not imply a change in pronunciation, for example ⟨baaja⟩ [paːja] "beer" and ⟨Guuti⟩ [kuːtˢi] "God"; these are pronounced exactly as /p t k/. The Kalaallisut syllable is simple, allowing syllables of (C)(V)V(C), where C is a consonant and V is a vowel and VV is a double vowel or word-final /ai/. Native words may only begin with a vowel or /p, t, k, q, s, m, n/; they may end only in /p, t, k, q/ or rarely /n/. Consonant clusters only occur over syllable boundaries and their pronunciation is subject to regressive assimilations that convert them into geminates. All non-nasal consonants in a cluster are voiceless. Greenlandic prosody does not include stress as an autonomous category; instead, prosody is determined by tonal and durational parameters. Intonation is influenced by syllable weight: heavy syllables are pronounced in a way that may be perceived as stress. Heavy syllables include syllables with long vowels and syllables before consonant clusters. The last syllable is stressed in words with fewer than four syllables and without long vowels or consonant clusters. The antepenultimate syllable is stressed in words with more than four syllables that are all light. In words with many heavy syllables, syllables with long vowels are considered heavier than syllables before a consonant cluster. Geminate consonants are pronounced long, almost exactly with the double duration of a single consonant. Intonation in indicative clauses usually rises on the antepenultimate syllable, falls on the penult and rises on the last syllable. Interrogative intonation rises on the penultimate and falls on the last syllable. Greenlandic phonology distinguishes itself phonologically from the other Inuit languages by a series of assimilations. Greenlandic phonology allows clusters, but it does not allow clusters of two different consonants unless the first one is /ʁ/. In all other cases the first consonant in a cluster is assimilated to the second one resulting in a geminate consonant. Geminate /tt/ is pronounced [ts] and written ⟨ts⟩. Geminate /ll/ is pronounced [ɬː]. Geminate /ɣɣ/ is pronounced [çː] but is written ⟨gg⟩. Geminate /ʁʁ/ is pronounced [χː]. Geminate /vv/ is pronounced [fː] and written ⟨ff⟩. /v/ is also pronounced and written [f] after /ʁ/. These assimilations mean that one of the most recognizable Inuktitut words, iglu ("house"), is illu in Greenlandic, where the /ɡl/ consonant cluster of Inuktitut is assimilated into a voiceless alveolar lateral fricative. And the word Inuktitut itself, when translated into Kalaallisut, becomes Inuttut. The Old Greenlandic diphthong /au/ has assimilated to /aa/. The consonant /v/ has disappeared when between /u/ and /i/ or /a/. This means that affixes beginning with -va or -vi have forms without [v] when suffixed to stems ending in /u/. The vowel /i/ of modern Greenlandic is the result of a historic merger of the Proto-Eskimo–Aleut vowels *i and *ɪ. The fourth vowel was still present in Old Greenlandic as attested by Hans Egede. In modern West Greenlandic the difference between the two original vowels can only be discerned morphophonologically in certain environments. The vowel that was originally *ɪ has the variant [a] when preceding another vowel and sometimes disappears before certain suffixes. The degree to which the assimilation of consonant clusters has taken place is an important dialectal feature separating Polar Eskimo, Inuktun, which still allows some ungeminated consonant clusters, from West and East Greenlandic. East Greenlandic (Tunumiit oraasiat) has shifted some geminate consonants, e.g. [ɬː] to [tː]. Thus, for example, the East Greenlandic name of a particular town is Ittoqqortoormiit, which would appear as Illoqqortoormiut in Kalaallisut. 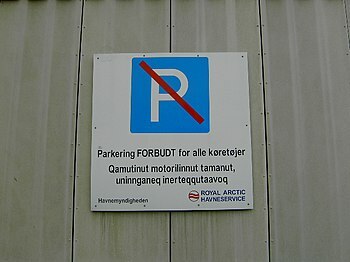 A bilingual sign in Nuuk, showing the contrast between Danish and Kalaallisut. The sign translates to "parking forbidden for all vehicles". The morphology of Greenlandic is highly synthetic and exclusively suffixing, with the exception of a single highly limited and fossilized demonstrative prefix. It creates very long words by means of adding strings of suffixes to a stem. [note 5] In principle there is no limit to the length of a Greenlandic word, but in practice words with more than half a dozen derivational suffixes are not so frequent, and the average number of morphemes per word is 3 to 5. [note 6] The language employs around 318 inflectional suffixes and between four and five hundred derivational ones. There are few compound words, but lots of derivations. The grammar employs a mixture of head and dependent marking: both agent and patient are marked on the predicate and the possessor is marked on nouns, while dependent noun phrases inflect for case. The morphosyntactic alignment of Kalaallisut is ergative. The language distinguishes four persons (1st, 2nd, 3rd and 4th or 3rd reflexive (see Obviation and switch-reference), two numbers (singular and plural; no dual as in Inuktitut), eight moods (indicative, participial, imperative/optative, interrogative, past subjunctive, future subjunctive and habitual subjunctive) and eight cases (absolutive, ergative, equative, instrumental, locative, allative, ablative and prolative). Verbs carry a bipersonal inflection for subject and object. Possessive noun phrases inflect for their possessor, as well as for case. In this section the examples are written in Greenlandic standard orthography except that morpheme boundaries are indicated by a hyphen. Greenlandic distinguishes three open word classes: nouns, verbs and particles. Verbs inflect for person and number of subject and object as well as for mood. Nouns inflect for possession and for case. Particles do not inflect. Oqar-poq "he says" Angut "A man" Naamik "No"
Angut sinippoq "the man sleeps"
Angut-ip asa-vaa "the man loves him/her/it"
Arnaq asa-vaa "(S)he loves the woman"
The Greenlandic language uses case to express grammatical relations between participants in a sentence. Nouns are inflected with one of the two core cases or one of the six oblique cases. Greenlandic is an ergative language. This means that, instead of treating the grammatical relations as in most European languages where grammatical subjects are marked with nominative case and objects with accusative, the grammatical roles are defined differently. In Greenlandic the ergative case is used for agents of transitive verbs and for possessors. Absolutive case is used for patients of transitive verbs and subjects of intransitive verbs. Research into Greenlandic as used by the younger generation has shown that the use of ergative alignment in Kalaallisut may be becoming obsolete, converting the language into a nominative–accusative language. Anda-p nanoq taku-aa "Anda sees a bear"
In transitive clauses where both object and subject are expressed as free noun phrases, basic, pragmatically neutral word order is AOXV / SXV, where X is a noun phrase in one of the oblique cases. This order is fairly free, though. Topical noun phrases occur at the beginning of a clause whereas new or emphasized information generally come last. This is usually the verb, but it can also be a focal subject or object as well. In spoken language also "afterthought" material or clarifications may follow the verb, usually in a lowered pitch. On the other hand, the noun phrase is characterized by a rigid order where the head of the phrase precedes any modifiers and the possessor precedes the possessum. In copula clauses the order is usually Subject-Copula-Complement. Andap tujuuluk pisiaraa "Anda bought the sweater"
An attribute appears after its head noun. Andap tujuuluk tungujortoq pisiaraa "Anda bought the blue sweater"
Anda sanasuuvoq pikkorissoq "Anda is a skilled carpenter"
Syntactic coordination and subordination is done by combining predicates in the superordinate moods (indicative, interrogative, imperative, optative) with predicates in the subordinate moods (conditional, causative, contemporative and participial). The contemporative has both coordinative and subordinative functions depending on context. The relative order of the main clause and its coordinate or subordinate clauses is relatively free, and mostly subject to pragmatic concerns. illu-a taku-aa "he saw his (the other man's) house"
illu-ni taku-aa "he saw his own house"
Ole oqar-poq tillu-kkiga "Ole said I had hit him (the other man)"
Ole oqar-poq tillu-kkini "Ole said I had hit him (Ole)"
Eva iser-uni sini-ssaa-q "When Eva comes in she'll sleep"
Eva iser-pat sini-ssaa-q When Eva comes in (s)he'll sleep (someone else). There is no category of definiteness in Greenlandic, so the information whether participants are already known to the listener or new in the discourse is encoded by other means. According to some authors, morphology related to transitivity such as the use of the construction sometimes called antipassive or intransitive object conveys such meaning, along with strategies of noun incorporation of non-topical noun phrases. This view, however, is controversial. Piitap arfeq takuaa "Peter saw the whale"
Piitaq arfermik takuvoq "Peter saw (a) whale"
The morphology of Greenlandic verbs is enormously complex. The two main processes are inflection and derivation. Inflectional morphology includes the processes of obligatory inflection for mood, person, and voice (tense/aspect is not an inflectional category in Kalaallisut). Derivational morphology modifies the meaning of verbs in a way similar to that expressed by adverbs in English. Derivational suffixes of this kind number in the hundreds. Many of these suffixes are so semantically salient that they are often referred to as postbases rather than suffixes, particularly in the American tradition of Eskimo grammar. Such semantically "heavy" suffixes may express concepts such as "to have", "to be", "to say", or "to think". The Greenlandic verb word consists of a root + derivational suffixes/postbases + inflectional suffixes. Tense and aspect is marked by optional suffixes that appear between the derivational and inflectional suffixes. Greenlandic verbs inflect for agreement with agent and patient, for mood and for voice. There are eight moods, of which four are used in independent clauses and four in subordinate clauses. The four independent moods are: indicative, interrogative, imperative, optative. The four dependent moods are causative, conditional, contemporative, and participial. Verbal roots can take transitive, intransitive or negative inflections, so that all eight mood suffixes have these three forms. The inflectional system is further complicated by the fact that transitive suffixes encode both agent and patient in a single morpheme, requiring up to 48 different suffixes to cover all possible combinations of agent and patient for each of the eight transitive paradigms. As some moods do not have forms for all persons (imperative only has 2nd person, optative only 1st and 3rd person, participial mood has no 4th person and contemporative has no 3rd person), the total number of verbal inflectional suffixes is about 318. The indicative mood is used in all independent expository clauses. The interrogative mood is used for posing questions. Questions with the question particle immaqa "maybe" cannot use the interrogative mood. Table 5 shows the intransitive indicative inflection for patient person and number of the verb neri- "to eat" in the indicative and interrogative moods (question marks mark interrogative intonation—questions have falling intonation on the last syllable as opposed to most Indo-European languages in which questions are marked by rising intonation). The indicative and the interrogative mood each have a transitive and an intransitive inflection, but here only the intransitive inflection is given. Consonant gradation like that in Finnish appears to show up in the verb conjugation (with strengthening to pp in the 3rd person plural and weakening to v elsewhere). nerivunga "I am eating" nerivunga? "Am I eating?" nerivutit "You are eating" nerivit? "Are you eating?" nerivoq "He/she/it eats" neriva? "Is he/she/it eating?" nerivugut "We are eating" nerivugut? "Are we eating?" nerivusi "You are eating (pl.)" nerivisi? "Are you eating? (pl.)" neripput "They are eating" nerippat? "Are they eating?" Table 6 shows the transitive indicative inflection for patient person and number of the verb asa- "to love" (an asterisk means that this form does not occur as such but would have to use a different reflexive inflection). * asavarma "You love me" asavaanga "He/she/it loves me"
asavakkit "I love you" * asavaatit "He/she/it loves you"
asavara "I love him/her/it" asavat "You love her/him/it" asavaa "He/she/it loves him/her/it"
* asavatsigut "You love us" asavaatigut "He/she/it loves us"
asavassi "I love you (pl.)" * asavaasi "He/she/it loves you (pl.)" asavakka "I love them" asavatit "You love them" asavai "He/she/it loves them"
The imperative mood is used to issue orders. It is always combined with the second person. The optative is used to express wishes or exhortations and is never used with the second person. There is a negative imperative form used to issue prohibitions. Both optative and imperative have transitive and intransitive paradigms. There are two transitive positive imperative paradigms: a standard one, and one that is considered rude and is usually used to address children. The conditional mood is used to construct subordinate clauses with the meaning "if" or "when". seqinner-pat Eva ani-ssaa-q "If the sun shines, Eva will go out"
The causative mood (sometimes called the conjunctive) is used to construct subordinate clauses with the meaning "because", "since" or "when"; it is also sometimes used with the meaning of "that". The causative is also used in main clauses to imply some underlying cause. qasu-gami innar-poq "He went to bed because he was tired"
matta-ttor-ama "I've eaten blubber (that's why I'm not hungry)"
ani-guit eqqaama-ssa-vat teriannia-qar-mat "If you go out, remember that there are foxes"
The contemporative mood is used to construct subordinate clauses with the meaning of simultaneity. It is only used if the subject of the subordinate clause and of the main clause are identical. If they differ, the participial mood or causative mood are used. The contemporative can also be used to form complement clauses for verbs of speaking or thinking. qasu-llunga angerlar-punga "Being tired, I went home"
98-inik ukio-qar-luni toqu-voq "Being 98 years old, he/she died", "he/she was 98 when he/she died"
Eva oqar-poq kami-it akiler-lugit "Eva said she had paid for the boots"
The participial mood is used to construct a subordinate clause describing its subject in the state of carrying out an activity. It is used when the matrix clause and the subordinate clause have different subjects. It is often used in appositional phrases such as relative clauses. atuar-toq taku-ara "I saw her read/I saw that she read"
neriu-ppunga tiki-ssa-soq "I hope he is coming/I hope he'll come"
Verbal derivation is extremely productive, and Greenlandic employs many hundreds of derivational suffixes. Often a single verb will use more than one derivational suffix, resulting in very long words. Below are given some examples of how derivational suffixes can change the meaning of verbs. taku-katap-para "I am tired of seeing it/him/her"
-ler- "begin to/be about to"
neri-ler-pugut "We are about to eat"
erinar-su-llaqqip-poq "She is good at singing"
aallar-niar-poq "He plans to travel"
angerlar-niar-aluar-punga "I was planning to go home though"
sini-ngajap-punga "I had almost fallen asleep"
taku-nikuu-nngila-ra "I have never seen it"
tiki-nngitsoor-poq "He hasn't arrived after all"
toqo-riikatap-poq "He died long ago"
ippassaq Piitaq arpap-poq "Yesterday Peter was running." All other things being equal and in the absence of any explicit adverbials, the indicative mood will be interpreted as complete or incomplete depending on the verbal aktionsart. Piitaq ani-voq "Peter was gone out"
But if a sentence containing an atelic verbal phrase is embedded within the context of a past time narrative, it would be interpreted as past. Greenlandic has several purely derivational devices of expressing meaning related to aspect and aktionsart, e.g. sar expressing "habituality" and ssaar expressing "stop to". Next to these, there are at least two major perfect markers: sima and nikuu. sima can occur in several positions with obviously different function Rightmost position indicates evidential meaning, but this can be determined only if a number of suffixes are present. tiki(t)-nikuu-sima-voq "Apparently, she had arrived"
With atelic verbs, there is a regular contrast between indirective evidentiality marked by sima and witnessed evidentiality marked by nikuu. Due to its evidential meaning, the combination of first person and sima sometimes is marked. qia-sima-voq "He cried (his eyes are swollen)"
qia-nikuu-voq "He cried (I was there)"
In the written language and more recently also in the spoken language especially of younger speakers, sima and nikuu can be used together with adverbials referring to a particular time in the past. That is, they might arguably mark time reference, but not yet systematically. suffixes denoting cognitive states that show an attitude about prospective actions. e.g. Ilimaga-ara aasaq manna Dudley qujanar-tor-si-ffigi-ssa-llugu "I expect to get some fun out of Dudley this summer." inchoative suffixes creating telic actions which can then be understood as already having begun by virtue of the indicative mood. e.g. Aggiuti-ler-para "I've started to bring him." moods that mark the speech act as a request or wish. e.g. Qimmi-t nirukkar-niar-nigik "Let us feed the dogs, ok?" While the status of the perfect markers as aspect is not very controversial, some scholars have claimed that Greenlandic has a basic temporal distinction between future and non-future. Especially, the suffix -ssa and handful of other suffixes have been claimed to be obligatory future markers. However, at least for literary Greenlandic, these suffixes have been shown to have other semantics that can be used to refer to the future via the strategies just described. There is also a debate in the linguistic literature whether Greenlandic has noun incorporation. This is because Greenlandic does not allow the kind of incorporation common in many languages in which a noun root can be incorporated into almost any verb to form a verb with a new meaning. On the other hand, Greenlandic does often form verbs that include noun roots. The question then becomes whether to analyse these verb formations as incorporation or as denominal derivation of verbs. Greenlandic has a number of morphemes that require a noun root as their host and which form complex predicates that correspond closely in meaning to what is often seen in languages that have canonical noun incorporation. Linguists who propose that Greenlandic does have incorporation argue that these morphemes are in fact verbal roots that must obligatorily incorporate nouns to form grammatical clauses. This argument is supported by the fact that many of the derivational morphemes that form denominal verbs work almost identically to canonical noun incorporation. They allow the formation of words with a semantic content corresponding to an entire English clause with verb, subject and object. Another argument is that the morphemes used to derive denominal verbs come from historical noun incorporating constructions that have become fossilized. Other linguists maintain that the morphemes in question are simply derivational morphemes that allow the formation of denominal verbs. This argument is supported by the fact that the morphemes cannot occur without being latched on to a nominal element. The examples below illustrate how Greenlandic forms complex predicates including nominal roots. qimme-qar-poq "She has a dog"
illu "house" + -'lior- "make"
illu-lior-poq "She builds a house"
kaffi "coffee" + -sor- "drink/eat"
puisi "seal" + -nniar- "hunt"
allagaq "letter" + -si- "receive"
allagar-si-voq "She has received a letter"
anaana "mother" + -a- "to be"
anaana-a-voq "She is a mother"
Nouns are obligatorily inflected for case and number and optionally for number and person of possessor. Singular and plural are distinguished and 8 cases used: absolutive, ergative (relative), instrumental, allative, locative, ablative, prosecutive (also called vialis or prolative), and equative. Case and number are marked by a single suffix. Nouns can be derived from verbs or from other nouns by a number of suffixes, e.g. atuar- "to read" + -fik "place" becomes atuarfik "school" and atuarfik + -tsialak "something good" becomes atuarfitsialak "good school". There are personal pronouns for first-, second-, and third-person singular and plural. These pronouns are optional as subjects or objects, but only when the verbal inflection refers to such arguments. thou all. eat tell-to 3s-3s-indic. The two grammatical core cases ergative and absolutive are used to express grammatical and syntactical roles of participant noun phrases. The oblique cases express information related to movement and manner. angu-t neri-voq "The man eats"
angu-tip puisi neri-vaa "The man eats the seal"
The instrumental case is versatile. It is used for the instrument with which an action is carried out, for oblique objects of intransitive verbs (also called antipassive verbs) and for secondary objects of transitive verbs. nano-q savim-mi-nik kapi-vaa "He stabbed the bear with his knife"
kaffimik tor-tar-poq "She usually drinks coffee"
Piitaq savim-mik tuni-vara "I gave Peter a knife"
sivisuu-mik sinip-poq "He slept late"
The allative case describes movement towards something. qassi-nut? – pingasu-nut. "When?" – "At three o'clock"
kiilu-mut tivi krone-qar-poq "It costs 20 crowns per kilo"
Rasmussi-mit allagarsi-voq "He got a letter from Rasmus"
tuttu-mit nassuk " (antler)horn from a rein-deer"
The prosecutive case describes movement through something as well as the medium of writing or a location on the body. It is also used to describe a group of people such as a family as belonging to the modified noun. matu-kkut iser-poq "He entered through the door"
su-kkut tillup-paatit? "Where (on the body) did he hit you?" palasi-kkut "the priest and his family"
The equative case describes similarity of manner or quality. It is also used for deriving language names from nouns denoting nationalities, i.e. "like a person of x nationality [speaks]". nakorsatut suli-sar-poq "he works as a doctor"
Qallunaa-tut "Danish language (like a Dane)"
1st person Sg. illora "my house" illukka "my houses"
2nd person Sg. illut "your house" illutit "your houses"
3rd person Sg. illua "his house" illui "his houses"
4th person Sg. illuni "his own house" illuni "his own houses"
1st person Pl. illorput "our house" illuvut "our houses"
2nd person Pl. illorsi "your (pl) house" illusi "your (pl) houses"
3rd Person Pl. illuat "their house" illui "their houses"
4th person Pl. illortik "their own house" illutik "their own houses"
In Greenlandic possession is marked on the noun which agrees with the person and number of its possessor. The possessor is in the ergative case. There are different possessive paradigms for all of the different cases. Table 4 gives the possessive paradigm for the absolutive case of illu "house". Below are given examples of the use of the possessive inflection, the use of the ergative case for possessors and the use of fourth person possessors. Anda-p illu-ni taku-aa "Anda sees his own house"
Anda-p illu-a taku-aa "Anda sees his (the other man's) house"
The orthography and vocabulary of the Greenlandic language is governed by Oqaasileriffik, the Greenlandic language secretariat, located in the Ilimmarfik university campus in Nuuk. Lexical differences between dialects are often considerable. This is due to the earlier cultural practice of imposing taboo on words which had served as names for a deceased person. Since people were often named after everyday objects, many of these have changed their name several times because of taboo rules, causing dialectal vocabulary to diverge further. To spell loanwords from other languages, especially from Danish and English, the additional letters B, C, D, X, Y, Z, W, Æ, Ø and Å are used. Greenlandic uses the symbols "..." and »...« as quotation marks. From 1851 until 1973, Greenlandic was written in the alphabet invented by Samuel Kleinschmidt. This alphabet employed the special character kra (Κʼ / ĸ) which was replaced by q in the 1973 reform. In the Kleinschmidt alphabet, long vowels and geminate consonants were indicated by means of diacritics on the vowels (in the case of consonant gemination, the diacritics were placed on the vowel preceding the affected consonant). For example, the name Kalaallit Nunaat was spelled Kalâdlit Nunât. This scheme uses a circumflex accent ( ˆ ) to indicate a long vowel (e.g., ât/ît/ût, modern: aat, iit, uut), an acute accent ( ´ ) to indicate gemination of the following consonant: (i.e., á, í, ú modern: a(kk), i(kk), u(kk))] and, finally, a tilde ( ˜ ) or a grave accent ( ` ), depending on the author, indicates vowel length and gemination of the following consonant (e.g., ãt, ĩt, ũt or àt, ìt, ùt, modern: aatt, iitt, uutt). The letters ê and ô, used only before r and q, are now written ee and oo in Greenlandic. The spelling system of Nunatsiavummiutut, spoken in Nunatsiavut in northeastern Labrador, is derived from the old Greenlandic system. Technically, the Kleinschmidt orthography focused upon morphology: the same derivational affix would be written in the same way in different contexts, despite its being pronounced differently in different contexts. The 1973 reform replaced this with a phonological system: Here, there was a clear link from written form to pronunciation, and the same suffix is now written differently in different contexts. The differences are due to phonological changes. It is therefore easy to go from the old orthography to the new (cf. the online converter) whereas going the other direction would require a full lexical analysis. ^ ⟨ff⟩ is the way of writing the devoiced /vv/ geminate, otherwise ⟨f⟩ only occurs in loanwords. ^ /ʃ/ is found in some dialects, but not in the standard language. ^ For example the word Nalunaarasuartaatilioqateeraliorfinnialikkersaatiginialikkersaatilillaranatagoorunarsuarooq which means something like "Once again they tried to build a giant radio station, but it was apparently only on the drawing board"
^ Compare this with the English rate of slightly more than one morpheme per word. ^ This article uses the following abbreviations for grammatical terminology in the example glosses: IND: indicative mood; INT: intransitive; TR: transitive; ABS: Absolutive case; I: first person singular; WE: first person plural; YOU: second person; 3p: third person; 4p: reflexive/obviative person; ERG: ergative case; CONT: contemporative mood; POSS: possessor; INSTR: instrumental case; NEG: negative; INTERR: interrogative mood; IMP: imperative mood; OPT: optative mood; COND: conditional mood; CAU: causative mood; PL: plural. For affixes about which the precise meaning is the cause of discussion among specialists the suffix itself is used as gloss and its meaning must be understood from context: -SSA ( meaning either future/expectation), -NIKUU and -SIMA. ^ In glosses of examples in Greenlandic the abbreviation "3p" means "third person singular" and has the same meaning as the English third person pronouns he, she and it, but it does not carry any information about gender. ^ The abbreviation "4p" refers to the fourth or reflexive person. ^ For example the suffix with the shape -aa means "his/hers/its" when suffixed to a noun, but "him/her/it" when suffixed to a verb, likewise the suffix -ra either means "my" or "me" depending on whether it is suffixed on a verb or a noun. ^ Hammarström, Harald; Forkel, Robert; Haspelmath, Martin, eds. (2017). "Kalaallisut". Glottolog 3.0. Jena, Germany: Max Planck Institute for the Science of Human History. ^ "Sermersooq will secure Eastern Greenlandic". Kalaallit Nunaata Radioa (in Danish). 2010-01-06. Retrieved 2010-05-19. ^ Fortescue (1984) pp. 276–287. The dividing line between aktionsart, aspect and still other functions not fitting into these categories would yet have to be clarified. ^ Bittner (2005) pp. 12–13; translation of 15 altered. Glosses standardised to the system used in this article. ^ "Malouf (1999)" (PDF). sdsu.edu. Archived from the original (PDF) on 2003-07-12. Retrieved 20 March 2018. ^ Marianne Mithun "Polysynthesis in the Arctic" in Mahieu and Tersis (2009). ^ "Programs for analysing Greenlandic". giellatekno.uit.no. Retrieved 20 March 2018. Bittner, Maria (1987). "On the Semantics of the Greenlandic Antipassive and Related Constructions" (PDF). International Journal of American Linguistics. 53 (2): 194–231. doi:10.1086/466053. Archived from the original (PDF) on 2011-06-06. Bittner, Maria (1995). "Quantification in Eskimo". In Emmon W. Bach. Quantification in natural languages. 2. Springer. ISBN 978-0-7923-3129-2. Bittner, Maria (2005). "Future discourse in a tenseless language". Journal of Semantics. 12 (4): 339–388. doi:10.1093/jos/ffh029. Bjørnum, Stig (2003). Grønlandsk grammatik (in Danish). Atuagkat. ISBN 978-87-90133-14-6. Fortescue, Michael (1980). "Affix Ordering in West Greenlandic Derivational Processes". International Journal of American Linguistics. 46 (4): 259–278. doi:10.1086/465662. JSTOR 1264708. Fortescue, Michael (1984). West Greenlandic. Routledge. ISBN 978-0-7099-1069-5. Fortescue, Michael (1991). "Switch reference anomalies and 'topic' in west greenlandic: A case of pragmatics over syntax". In Jef Verschueren. Levels of Linguistic Adaptation: selected papers of the International Pragmatics Conference, Antwerp, August 17–22, 1987, volume II. Philadelphia: John Benjamins. ISBN 978-1-55619-107-7. Fortescue, Michael (1991). Inuktun: An introduction to the language of Qaanaaq, Thule. Institut for Eskimologi, Københavns Universitet. ISBN 978-87-87874-16-8. Fortescue, Michael & Lise Lennert Olsen (1992). "The Acquisition of West Greenlandic". In Dan Isaac Slobin. The Crosslinguistic study of language acquisition, vol 3. Routledge. pp. 111–221. ISBN 978-0-8058-0105-7. Fortescue, Michael (1993). "Eskimo word order variation and its contact-induced perturbation". Journal of Linguistics. 29 (2): 266–289. doi:10.1017/S0022226700000335. JSTOR 4176235.
van Geenhoven, Veerle (1998). Semantic incorporation and indefinite descriptions: semantic and syntactic aspects of noun incorporation in West Greenlandic. Stanford: CSLI Publications. ISBN 978-1-57586-133-3.
van Geenhoven, Veerle (2002). "Raised Possessors and Noun Incorporation in West Greenlandic". Natural Language & Linguistic Theory. 20 (4): 759–821. doi:10.1023/A:1020481806619. Goldbach, Ib & Thyge Winther-Jensen (1988). "Greenland: Society and Education". Comparative Education. 24 (2, Special Number (11)): 257–266. doi:10.1080/0305006880240209. Grønlands sprognævn (1992). Icelandic Council for Standardization. Nordic cultural requirements on information technology. Reykjavík: Staðlaráð Íslands. ISBN 978-9979-9004-3-6. Hayashi, Midori & Bettina Spreng (2005). "Is Inuktitut tenseless?" (PDF). In Claire Gurski. Proceedings of the 2005 Canadian Linguistics Association Annual Conference. 2005 CLA Annual Conference. Archived from the original (PDF) on 2010-01-08. Retrieved 2010-01-10. Iutzi-Mitchell, Roy D. & Nelson H. H. Graburn (1993). "Language and educational policies in the North: Status and Prospectus report on the Eskimo–Aleut languages from an international symposium". International Journal of the Sociology of Language. 1993 (99): 123–132. doi:10.1515/ijsl.1993.99.123. Jacobsen, Birgitte (2000). "The Question of 'Stress' in West Greenlandic:An Acoustic Investigation of Rhythmicization, Intonation, and Syllable Weight". Phonetica. 57 (1): 40–67. doi:10.1159/000028458. PMID 10867570. Kappel Schmidt, Bodil (2003). "West Greenlandic Antipassive". Nordlyd. Proceedings of the 19th Scandinavian Conference of Linguistics. 31 (2): 385–399. Archived from the original on 2008-12-02. Retrieved 2010-01-10. Malouf, Robert (1999). "West Greenlandic noun incorporation in a monohierarchical theory of grammar" (PDF). In Gert Webelhuth; Andreas Kathol; Jean-Pierre Koenig. Lexical and Constructional Aspects of Linguistic Explanation. Studies in constraint-based lexicalism. Stanford: CSLI Publications. ISBN 978-1-57586-152-4. Mennecier, Philippe (1995). Le tunumiisut, dialecte inuit du Groenland oriental: description et analyse. Collection linguistique, 78 (in French). Société de linguistique de Paris, Peeters Publishers. ISBN 978-2-252-03042-4. Mithun, Marianne (1984). "The evolution of noun incorporation". Language. 60 (4): 847–895. doi:10.2307/413800. JSTOR 413800. Mithun, Marianne (1986). "On the nature of noun incorporation". Language. 62 (1): 32–38. CiteSeerX 10.1.1.692.5196. doi:10.2307/415599. JSTOR 415599. Petersen, Robert (1990). "The Greenlandic language: its nature and situation". In Dirmid R. F. Collis. Arctic languages: an awakening. Paris: Unesco. pp. 293–308. ISBN 978-92-3-102661-4. Rischel, Jørgen (1974). Topics in West Greenlandic Phonology. Copenhagen: Akademisk Forlag. ISBN 978-87-500-1438-6. Rischel, Jørgen (1985). "Was There a Fourth Vowel in Old Greenlandic?". International Journal of American Linguistics. 51 (4): 553–555. doi:10.1086/465970. Rosen, Sara T. (1989). "Two types of noun incorporation: A lexical analysis". Language. 65 (2): 294–317. doi:10.2307/415334. JSTOR 415334. Sadock, Jerrold (1980). "Noun incorporation in Greenlandic: A case of syntactic word-formation". Language. 57 (2): 300–319. doi:10.1353/lan.1980.0036. JSTOR 413758. Sadock, Jerrold (1986). "Some notes on noun incorporation". Language. 62 (1): 19–31. doi:10.2307/415598. JSTOR 415598. Sadock, Jerrold (1999). "The Nominalist Theory of Eskimo: A Case Study in Scientific Self Deception". International Journal of American Linguistics. 65 (4): 383–406. doi:10.1086/466400. JSTOR 1265857. Shaer, Benjamin (2003). "Toward the tenseless analysis of a tenseless language" (PDF). In Jan Anderssen; Paula Menéndez-Benito; Adam Werle. Proceedings of SULA 2. 2nd Conference on the Semantics of Under-represented Languages in the Americas. GLSA, University of Massachusetts Amherst. pp. 139–56. Trondhjem, Naja Frederikke (2009). "11. The marking of past time in Kalaallisut, the Greenlandic language". In Mahieu, Marc-Antoine & Nicole Tersis. Variations on polysynthesis: the Eskaleut languages. Typological studies in language, 86. John Benjamins. pp. 171–185. ISBN 978-90-272-0667-1. Underhill, Robert (1976). "The Case for an Abstract Segment in Greenlandic". International Journal of American Linguistics. 42 (4): 349–358. doi:10.1086/465439. JSTOR 1264267. Woodbury, Anthony C. (1983). "Switch-reference, syntactic organization, and rhetorical structure in Central Yup'ik Eskimo". In John Haiman; Pamela Munro. Switch-reference and universal grammar. Typological studies in language, 2. Amsterdam: John Benjamins. pp. 291–316. ISBN 978-90-272-2862-8. Wikivoyage has a phrasebook for Greenlandic. Wikimedia Commons has media related to Greenlandic language. This page was last edited on 2 April 2019, at 15:55 (UTC).